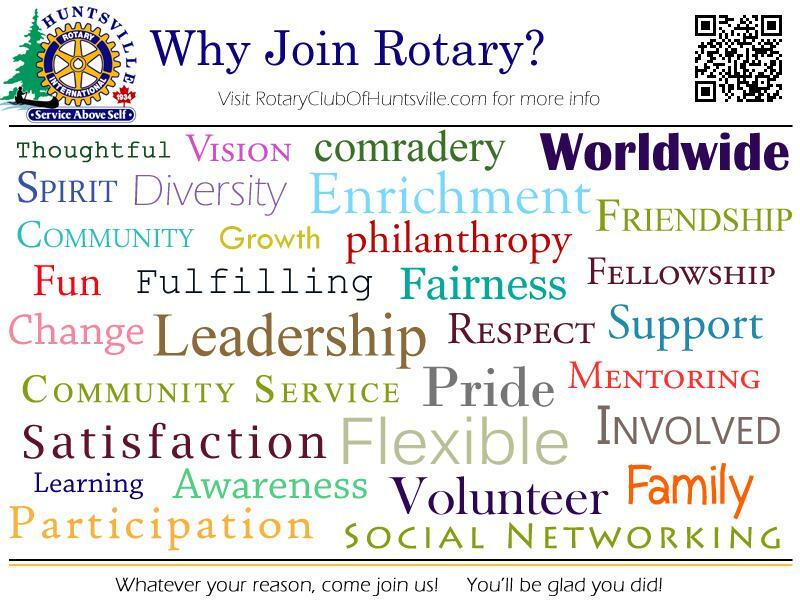 Interested in Becoming a Member of Rotary? Maybe you’ve seen a need in your own community and wondered how you could help. Maybe you want to use your professional skills to help others — or even learn new skills. Maybe you’re seeking connections with other service-minded professionals in your community or abroad. The club is the cornerstone of Rotary, where the most meaningful work is carried out. All effective Rotary clubs are responsible for four key elements: sustaining or increasing their membership base , participating in service projects that benefit their own community and those in other countries, supporting The Rotary Foundation of RI financially and through program participation, and developing leaders capable of serving in Rotary beyond the club level. What Rotarians get out of Rotary depends largely on what they put into it. Many membership requirements are designed to help members become and remain active participants in their clubs and enjoy their Rotary experience. Rotary is essentially a grassroots organization, with most of its service efforts being carried out at the club level. The district and international structure is designed to support the clubs and help them provide more service in their local communities and abroad. All Rotary clubs share a key mission: to serve their community and those in need throughout the world. By participating in club service projects , members learn about their club's involvement in local and international projects and can volunteer their time and talents where they are most needed. To keep clubs strong, every Rotarian must share the responsibility of bringing new people into Rotary. Even new members can bring guests to meetings or invite them to participate in a service project. The value of Rotary speaks for itself, and the best way to spark the interest of potential members is by letting them experience fellowship and service firsthand. Keeping members interested in Rotary is another responsibility. Good club fellowship, early involvement in service projects and involvement in club operations are some of the best ways to sustain the club's membership. The ideal composition of a Rotary club reflects the community's demographics, including professions, gender, age, and ethnicity. Such diversity enriches every aspect of the club's fellowship and service. Attending club meetings allows members to enjoy their club's fellowship, enrich their professional and personal knowledge, and meet other business leaders in their community. Club meeting times vary to accommodate members' family and professional commitments. Some clubs meet at lunchtime, while others meet in the early morning, after work, or in the evening. Rotary policy requires members to attend at least 50 percent of club meetings in each half of the year. If members miss their own club's meeting, they're encouraged to expand their Rotary horizons by attending make-up meetings at any Rotary club in the world — a practice that guarantees Rotarians a warm welcome in communities around the globe. Find meeting places and times in the Official Directory or through the online Club Locator . Rotarians can also make up meetings by participating in a club service project or by attending a club board meeting, a Rotaract or Interact club meeting, or an online meeting at one of several Rotary e-clubs . Rotarians are members of Rotary clubs , which belong to the global association Rotary International (RI). Each club elects its own officers and enjoys considerable autonomy within the framework of Rotary’s constitution and bylaws. Clubs are grouped into 530 RI districts , each led by a district governor, who is an officer of RI. The district administration, including assistant governors and various committees, guides and supports the clubs. The 19-member RI Board of Directors , which includes the RI president and president-elect, meets quarterly to establish policies. Traditionally, the RI president, who is elected annually, develops a theme and service emphases for the year. Rotary international is headquartered in the Chicago suburb of Evanston, Illinois, USA, with seven international offices in Argentina , Australia , Brazil, India , Japan , Korea , and Switzerland . The office for RI in Great Britain and Ireland ( RIBI ), located in England, serves clubs and districts in that region. The Secretariat’s chief operating officer is the RI general secretary, who heads a 740-member staff working to serve Rotarians worldwide. There's something that all Rotary club members have in common: We take action. As community volunteers, we reach out to neighbors in need. We build, support, and organize. We save lives. We work locally and globally. Around the world and around the corner, the 1.2 million men and women of Rotary. Use their skills to help others Whether you're a veteran volunteer or new to community service, we're looking for people like you.